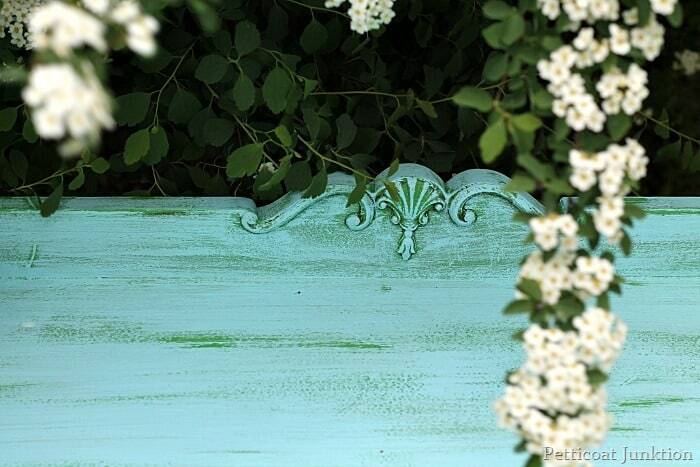 Furniture distressed is furniture with character. My new saying! You guys know I love bright, bold colors. Well, this project includes two bold colors. The two colors have swipes of Vaseline sandwiched between them. 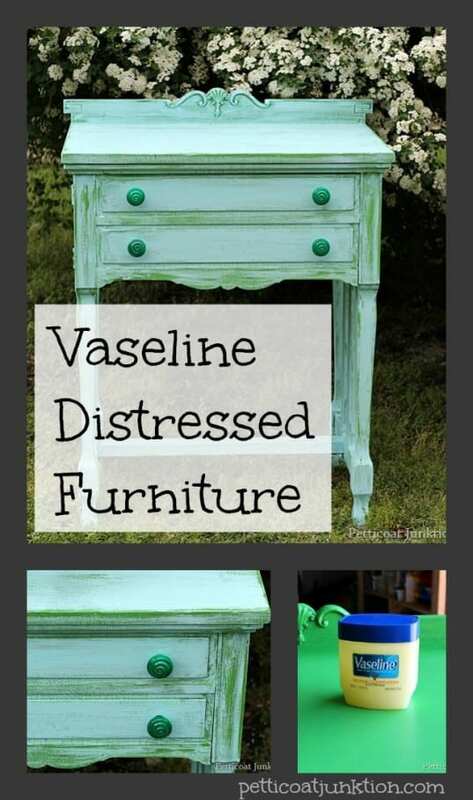 The Vaseline distressed furniture finish is an easy one…..if you swipe on enough Vaseline. What a fun color combination. 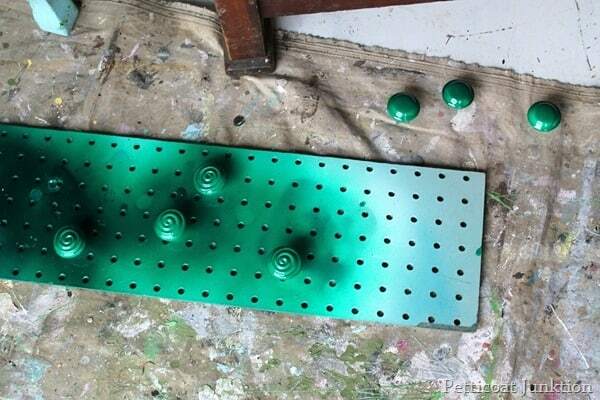 And those green knobs! I got this piece at the Nashville Flea Market . 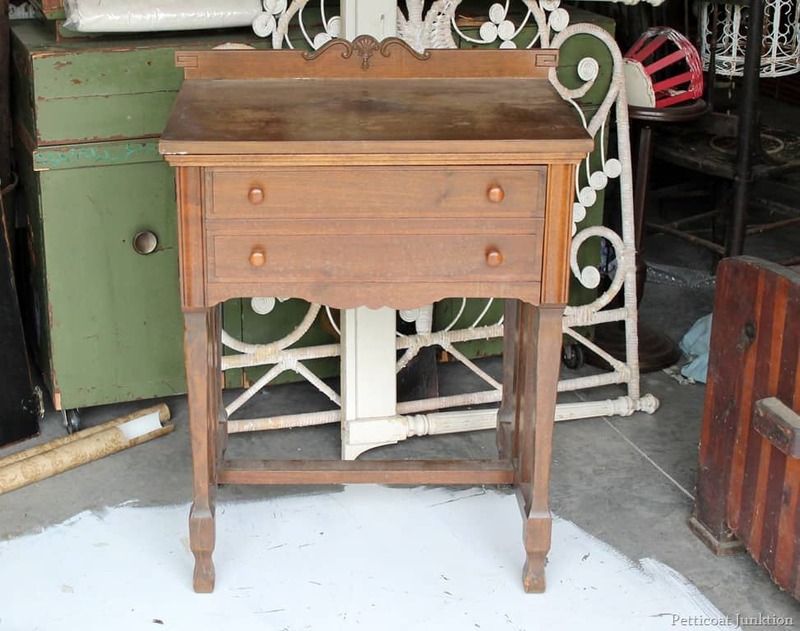 It’s a sewing cabinet and it still had the sewing machine inside…minus electric cord and foot pedal. The JTS removed the machine for me and I started painting. I’m lucky to have the JTS. He does so much of the prep work on my furniture projects. The paint girl at Lowes mixed some custom paint for me. wow Love that bright green! I applied two coats of paint and moved on to the next step once the green paint was dry. I pulled on a pair of latex gloves and put a thin layer of Vaseline on areas of the table. Then I painted on a layer of turquoise paint. 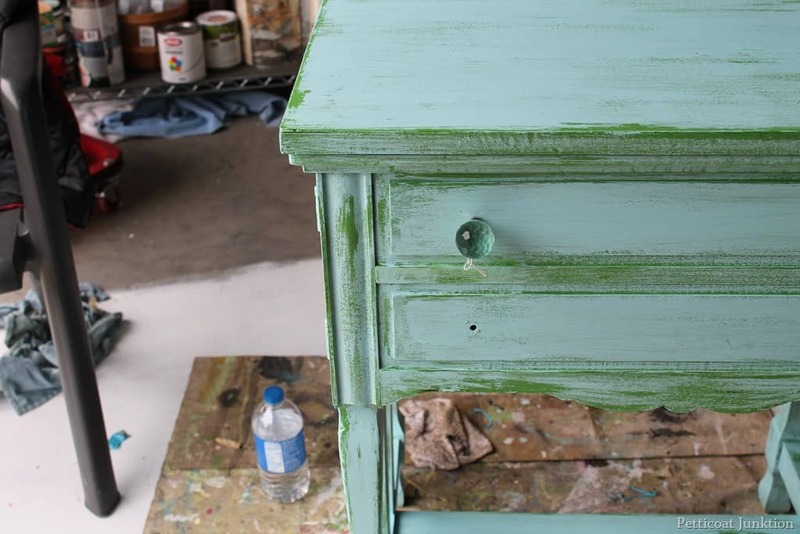 As soon as the turquoise paint was dry I used a shop towel…those that come in the can and have a cleaning product on them….and started wiping off turquoise paint. I either didn’t rub on enough Vaseline or that paint is good stuff because I had to rub and rub to get that paint off. Here’s how it looked after the wet distressing. I bought the knobs at Hobby Lobby but they weren’t doing it for me…not bright enough…not much of a statement. I’ve used these knobs on a piece before and I love them but not for this table. 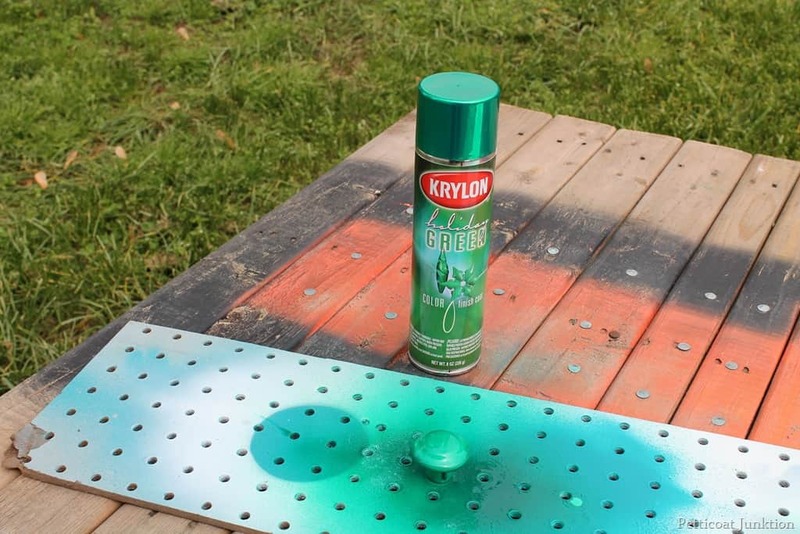 I grabbed some white porcelain knobs from my stash and this Krylon spray paint. The paint has been in my workshop for several years. I bought it at a thrift store and it was in a package with a can of silver paint. The name on the paint is holiday green. I’m sure they don’t make it anymore but I wish they did. It’s the brightest, shiniest, prettiest green. The photos don’t do it justice. When I started putting the knobs on the table I noticed one of the knobs was missing the screw threads inside……it’s always something! I found 4 more porcelain knobs with the swirl design and I painted them. See how shiny the top three are? The others have the same sheen but they were still wet when I took this photo. Turquoise and green are one of my favorite color combinations. 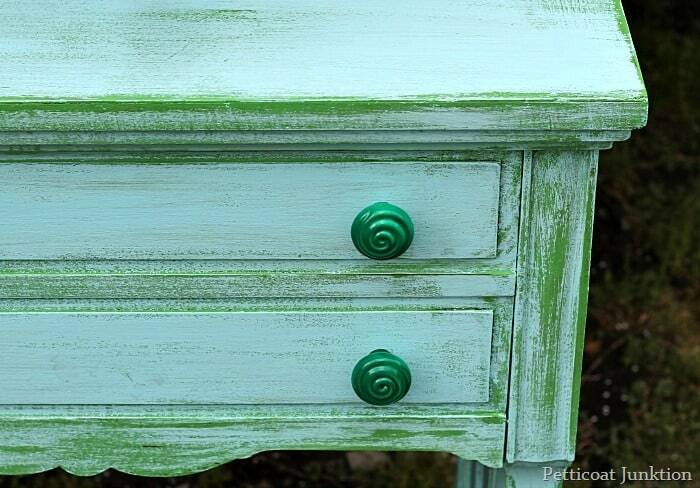 Furniture with details are the best for distressing the paint. The details really pop! It’s been cloudy and rainy here for days.I took photos of the table inside but when the sun popped out for 30 minutes yesterday me and the JTS hauled the table outside and I started taking photos. The photos were taken in front of my bridal veil bush. We have two of them and they are humongous. The flowers are always so pretty. I wish it bloomed all summer too. Check out my first Vaseline distressed project, it’s a doozy……Red And Turquoise Stenciled Chest. This project first appeared on Petticoat Junktion in 2014. It has been updated with new info and photos. If you missed the project the first time around I hope you enjoyed the tutorial. I have a similar question… When you’re putting the second color on after the vaseline…doesn’t the brush smear it to other places? Does the vaseline goop-up the brush ??? Love the color combo! 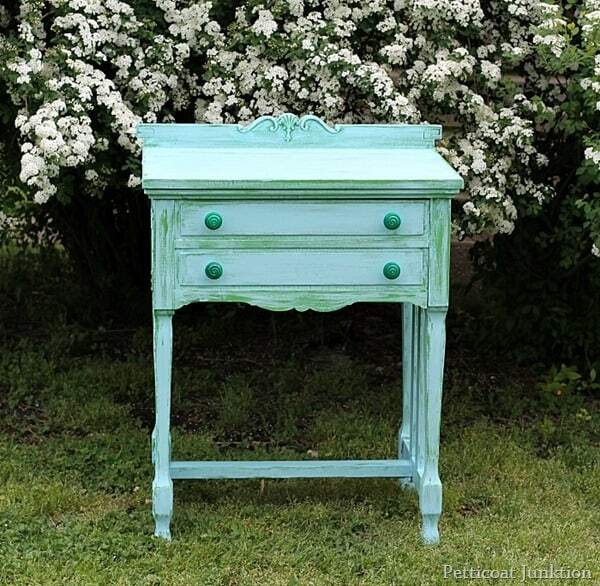 I tend to like turquoise with blue, but this is also lovely! It’s important that you wipe on the proper amount of Vaseline. It doesn’t take very much at all. It’s hard to tell you how much is the right amount. I’ve put on too much before and it did smear and it was a disaster. Try applying the Vaseline with your fingertips. Also just apply the Vaseline where you want to distress the paint. I believe I need to do an in depth tutorial on the Vaseline trick. Thanks! This turned out to be beautiful! I am not a color green person, but done this way, it is lovely. The red blanket cabinet at the bottom of the blog is awesome! You do magic with your creativity … keep it up! I have a question that may have been answered already does the vaseline smear on the top coat when wiped and how do you clean it off? The Vaseline does not smear. The only time I had that problem is when I wiped on way too much Vaseline. 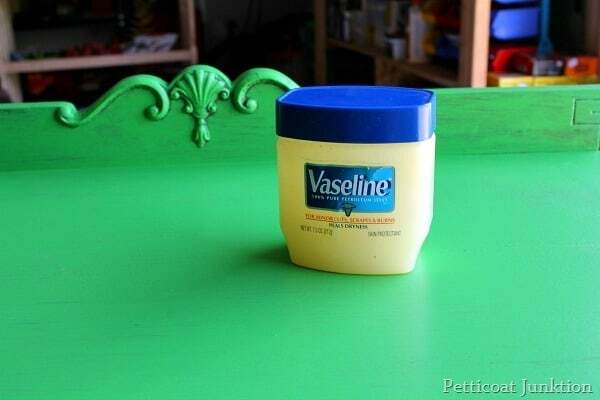 If you put on the right amount of Vaseline you will never know it was there. It does take a bit of a learning curve. It doesn’t take much Vaseline at all. Love the way this looks. A great pc. As sways your work is beautiful. i have never been a fan of painting wood, but i think i’m getting there! thanks for the inspiration! just maybe if i paint a piece or two, i’ll be able to let go of them! Kathy, This is my first time on the site and I feel so lucky that the frist thing I got to see was your beautiful sewing table such a great job. May I ask where you found the nobs, my Daughter. is expecting her first child and I am trying to surprise her with all the furniture she will need for the nursery and I think they would be perfect on the dresser/changing table. Again awesome job. I love green and turquoise too and you did a great job on this piece. Have a great weekend! 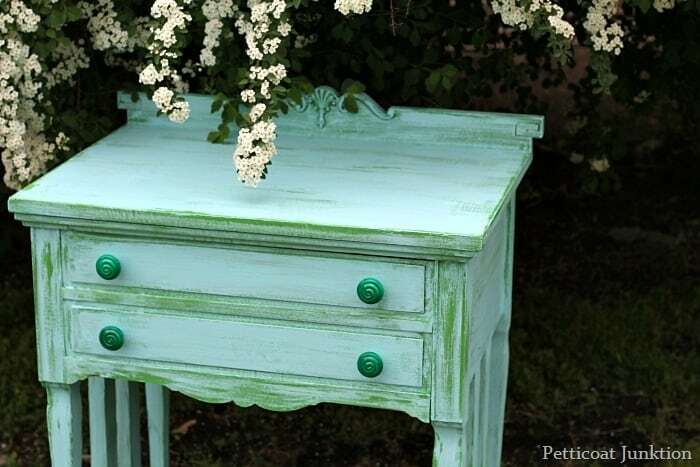 The two greens look so nice together and I adore those bright knobs! Nice redo. Love the colors. 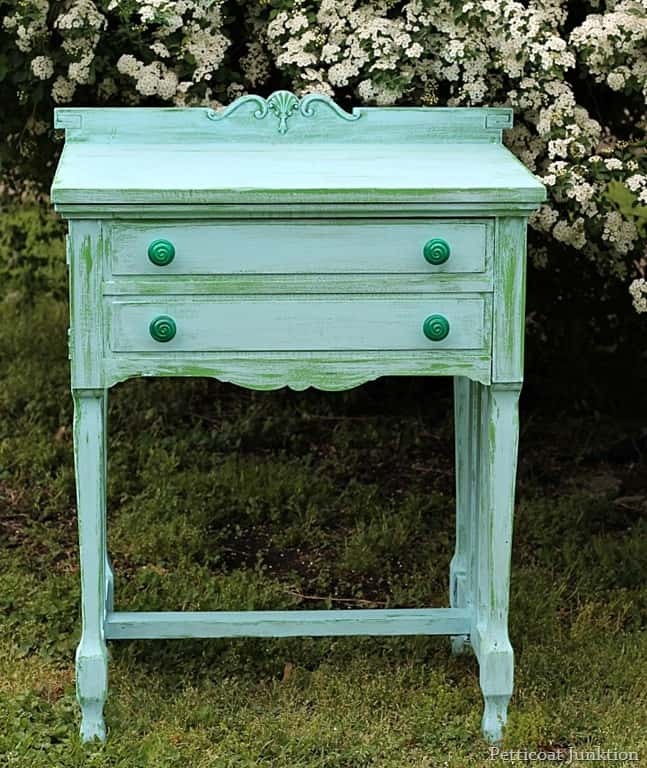 Would not have thought to use the bright green with the turquoise. Will be looking for a piece like this one. The details are incredible. Love it Kathy! The 2 colors look fabulous together! Very nice~ Love the knobs too! Oh my gosh! Blue and green together! my favorite colors. Super big fan of your work Kathy! Love this! I love bright colors also. This looks awesome!! Great colors for Spring, Kathy! Can’t wait to find an old sewing machine like this so I can try your technique! Great job! I LOVE the way the two colors look together! Beautiful piece Kathy!